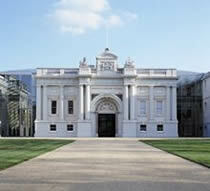 The impressive National Maritime Museum is the world's largest maritime museum. The museum forms part of the Maritime Greenwich World Heritage Site, which includes the Royal Observatory and Queen's House. It displays a wide array of over two million naval and seafaring artefacts and more than 100,000 nautical books in the library. The museum provides in depth information about Britain's nautical history and tells of how we have used it for trade, war and discovery. The museum also explores how our relationship with the sea has changed throughout time, right from when we first thought the world was flat, up until the present day.